New York, NY: Penguin Books, 2013. 1st Frieda Klein mystery. As new, appears unread.. Reprint. Trade Paperback. Fine. 8vo - over 7¾" - 9¾" tall. Immensely intelligent and poignantly human, Frieda Klein has captivated book critics and crime readers everywhere with her debut outing as Blue Monday 's iconoclastic heroine. A psychotherapist and insomniac who spends her nights walking along the ancient rivers that lie beneath modern London, Frieda stars in a dazzling new crime series in which the terrors of the mind spill over into real life. When five-year-old Matthew Farraday is abducted, Frieda cannot ignore the fact that his photograph perfectly matches the boy one of her patients describes from his fantasies. Before long, Frieda finds herself serving as the reluctant sidekick of Detective Chief Inspector Karlsson at the center of a desperate race to find the kidnapper. 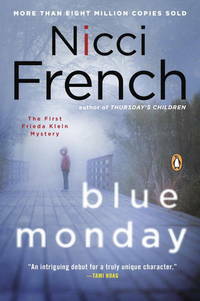 Blue Monday is an atmospheric, stunning first novel in a crime series for fans of In Treatment and The Killing .